I first became aware of the Parajumpers brand when I visited the Paragon Sports store a few years ago so I knew they would be a good brand for a warm winter coat aside from the ubiquitous Canada Goose, which I was also considering. 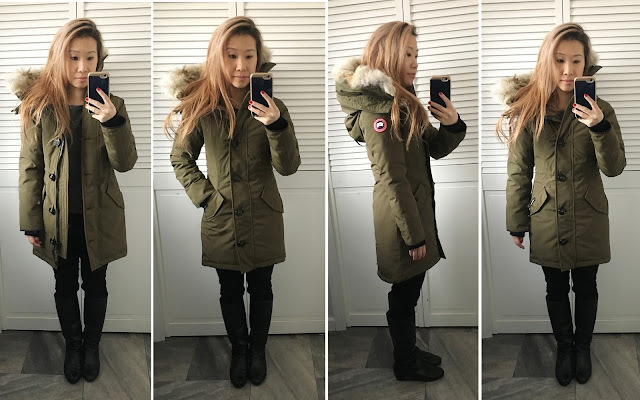 I remember trying on the girl's Canada Goose Brittania a while ago, which didn't fit quite right and so was much more interested in seeing how Parajumpers fit. 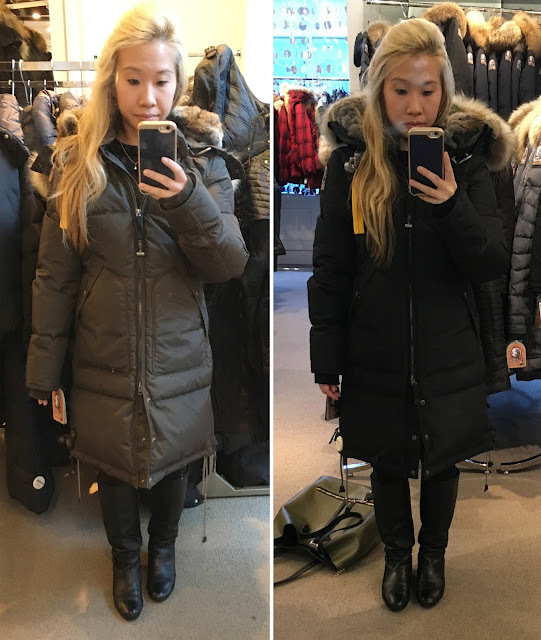 I took a quick trip to Bloomingdale's at 59th Street to try the Parajumpers Long Bear Coat I've been eyeing and am very glad I did because the store has such a great selection of winter coats! 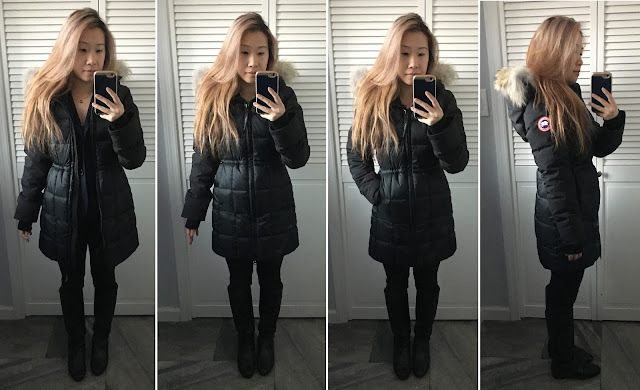 I realized it was way too big and puffy, despite the reviews stating it's very slim-fitting. Parajumpers Long Bear Coat in Bush and Black, size XS. Though that didn't work out like I hoped, I was really happy to see that there were so many other styles that I was able to try on from them. Out of the Parajumpers Long Bear Coat, Parajumpers Angie Down Coat, and Parajumpers Selma Fur Trim Down Parka that I tried on, I absolutely liked Selma the best. Even though both Selma and Angie are much more lightweight than Long Bear, they all have the same very high warmth rating, which means they're good for temperatures below 0. 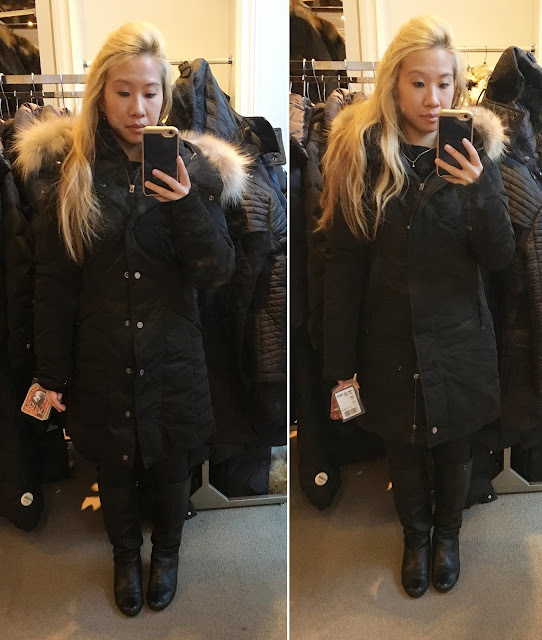 I decided to try on the Women's Canada Goose Kensington to compare and found the fit of a XS in this Bloomingdale's exclusive (love the dark fur trim) is better in terms of the sleeve length (because of the knit cuff) but I still preferred the overall look of the Parajumpers Selma, which looks much sleeker. Even though the sleeves were a bit too long on the Selma, I still decided I wanted it so I was more than happy to see that this comes in size XXS too. The XS was already quite snug on me overall so I hope XXS fits well. 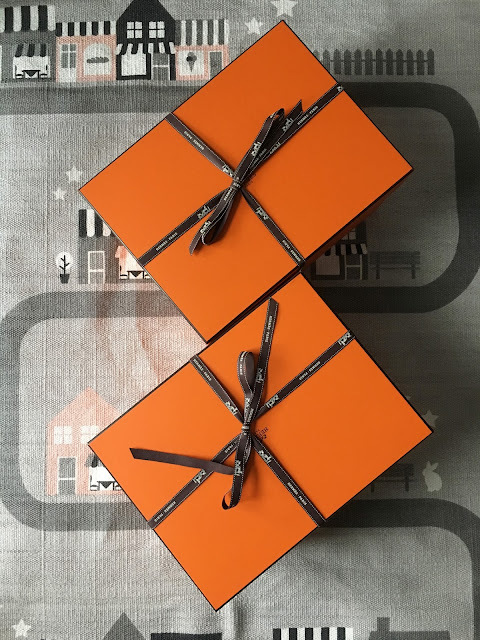 A says he won't give it to me until Christmas so I'm looking forward to it!